Having had formal training mainly in India, and that too in Delhi, one can note a dearth of opportunities in orchestral experience. There exists few orchestras that are accessible to students and I say quite humbly, that very few are able to play at a high standard and can perform a challenging repertoire. It is mainly professional orchestral units that can perform such repertoires properly, and considering that most students are not likely to be full-time musicians, I feel that it is hard for one to grow as a performer due to the lack of true orchestral experience. However, my entire outlook on student orchestras was overhauled when I walked into the Aula of the Rheinische Friedrich-Wilhelms-Universität Bonn. Bonn, of North Rhine-Westphalia, Germany, is the birthplace of the eminent composer Ludwig van Beethoven, and is deeply rooted in music culture. A casual stroll towards a bus stop or a subway station will result in encounters with someone carrying an orchestral instrument. Concerts are frequent here, with the Kreuzkirche and Beethovenhalle being hotspots. Seeing all this, I fully expected that even a student orchestra, and especially one that was part of Bonn’s most well-known university, would be a notch above all the student orchestras I’ve played with in India. My overestimation was proven false, but in the opposite sense; they were gigantic leaps ahead of any student orchestra in India. On that particular Wednesday night, when I sat in for the practice, I must admit that I was overwhelmed. This would be the first time that I was working with wind instruments live, an opportunity one rarely gets in India. 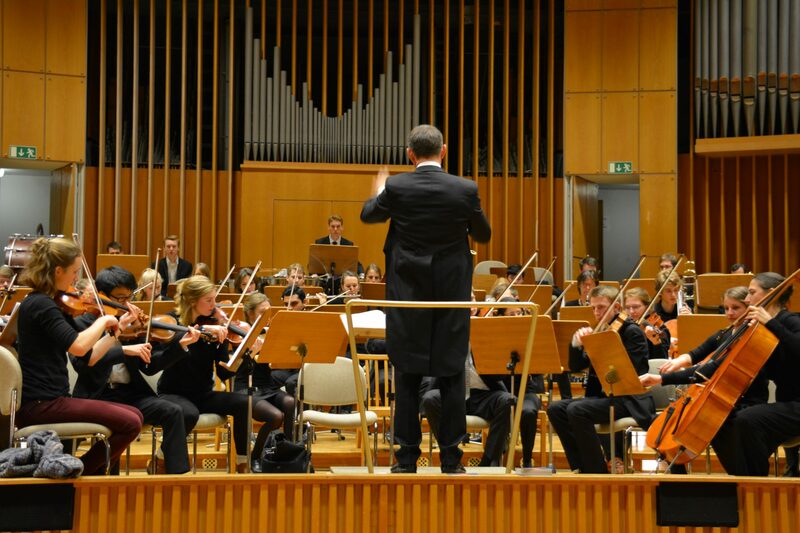 The orchestra of the Collegium Musicum Bonn consists of about 90 students from all faculties of the university. It was founded in 1953 by Prof. Dr. Emil Platen and has performed extensively in Germany, and also in countries such as Romania, Cyprus and South Korea. The orchestra covers the entire breadth of symphonic repertoire from Baroque to the 20th century, with a focus on large works of the Romantic period. The current conductor is Philipp Michael Barth. I had written to the orchestral board of Collegium Musicum Bonn about joining them, and they suggested that I first sit in for a practice before I give an audition. On that particular Wednesday night, when I sat in for the practice, I must admit that I was overwhelmed. This would be the first time that I was working with wind instruments live, an opportunity one rarely gets in India. The piece that was being rehearsed was Romeo and Juliet by Pyotr Ilyich Tchaikovsky. The extensive symphonic poem based on three main strands of the Shakespeare story, was extremely difficult; yet the orchestra was producing a cohesive sound. Talking to one of the violinists later, I was amazed to hear that this was the first practice of the semester, and that everyone was sight-reading! The rehearsal then shifted over to Robert Schumann’s Symphony No. 3 in E-Flat Major. Although, perceived as rather easy, it was quite difficult for someone like me, who isn’t used to sight-reading highly technical music. This would mark the first time that I have played with a symphonic orchestra, and it was indeed an unforgettable experience. The magnitude of knowledge that I have amassed in these two months, has indeed enhanced my playing. The entire atmosphere of people working together intensely to produce wonderful music is what stimulates one to get better and which also was my main reason to join the orchestra. As the concert date came closer, the practices became a bit more frequent, leaving no room for errors. Winds were told off for pitching for notes not in compliance with the composition; and strings were trained to ensure intonation was on point. A surprise was that, for the concert, we had a few guest musicians who joined us to play the English Oboe and Harp for Romeo and Juliet. Our effort culminated on the 3rd of December, with a successful performance, though it was noted that our Schumann was not as good as we had hoped it to be; but our Tchaikovsky definitely enraptured the audience, with abundant praise for the passionate rendition of the love-theme by the strings. This would mark the first time that I have played with a symphonic orchestra, and it was indeed an unforgettable experience. The magnitude of knowledge that I have amassed in these two months, has indeed enhanced my playing. I am looking forward to performing with Collegium Musicum Bonn again, later in this winter semester, and in the future semesters to come. Amitayus Banik is currently a Master of Physics student at the University of Bonn, Germany, and a trained musician, with his studies on the violin beginning at the age of four. An avid learner, he seeks to develop his skills for music and physics together, and has explored their inherent connections in his previous works. He holds a Bachelor of Science degree in Physics from the University of Delhi and an ATCL diploma in violin performance. He is also a voracious reader and when time permits, a writer with an inclination towards writing for popular sciences.